It’s 1987 and it’s odd to imagine that the Centre Georges Pompidou/Mnam was ever only ten years old. For those who can recall the two massive craters which scarred the Paris city center during the seventies, holes to be filled with what would become Les Halles, and Beaubourg, it seems as if it had always been there, tamed, as both sites were, by the local fauna gathering at the waters of the Fontaine des Innocents, and an incessant throng of tourists spread out on the Piano ‘parvis’. A landscape that would ironically define the Mitterrand years. 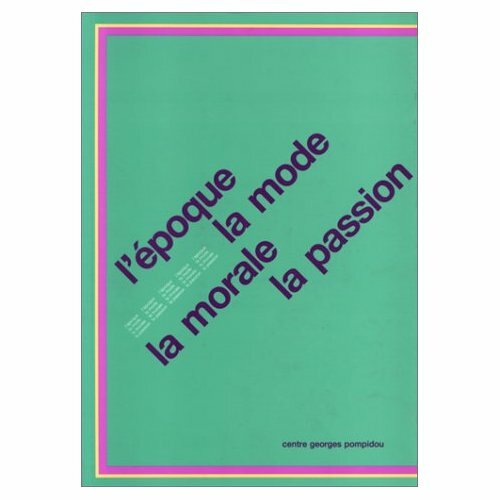 In 1987, in order to celebrate its tenth anniversary, head curators Bernard Ceysson, Alfred Paquement, Bernard Blistene, Catherine David and Christine Van Assche staged an impressive group show that would test the aesthetic waters of our then-era, through the prisms of fashion, morality and passion. 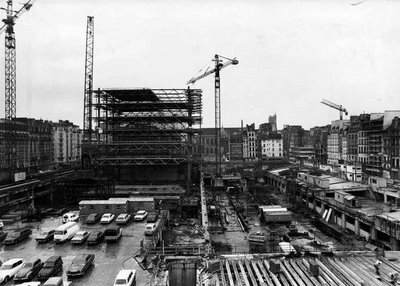 In just a decade the Centre Pompidou had become a player, and the curators linked the institution’s history to what informed art production over the same duration. As if it played a role that moved beyond that of witness, forging instead those ‘tastes’ that defined fashion and passion. Anything for the taking in those years when the art scene stopped having a center, a home. The bold bright colorful catalogue didn’t seek subtlety, indeed the very idea seemed forbidden during the eighties. The exhibition sought to be open, to reflect the end of groups and movements, putting to rest the wave of neo/trans modes of creation, from expressionism to pop to avant-garde, and lauding the age of ‘post’. Subjectivity still reigned, there was no media/communication environment to challenge at the ready, ideologies floated in the ether, 1989 so far away. Catherine David, years before her media saturated edition of Documenta, believed that there were only five or six yearly shows warranting interest, thereby displacing the concept of ‘actual art’ that made the fortunes of publishers like Taschen. Locating these new territories would require more time, and new explorers. Examining the list of more than fifty artists which made up the show (1) reveals how the era, according to this quartet of curators, still belonged to heavyweights, mostly painters, along with key conceptual figures accompanied by their heirs. Three American women, Holzer-Kruger-Sherman, carved a niche, while new mediums such as video were set aside, by themselves in a selection of tapes curated by the Center’s Christine Van Assche, waiting her turn in the nineties when Marcel Odenbach, Gary Hill, Tony Oursler,etc. had their day and installations ruled. Nearly twenty-five years later, most of these artists have either slipped into history or under the radar. Seeing the show as a twenty-something, reading Greil Marcus, Debord, Kroker, the way one reads Vian, Orwell and Camus in one’s teens, theory the blade that cut the fat from the paunch of art, tuned to what was ‘american and alternative’ (from Kim Gordon and Mike Kelly to Gonzalez-Torres, before it all went Purple), the Beaubourg show seemed magnificently baroque and decadent, intensely Parisian in its dismissal of the ‘low’ tide coming in, unable to anticipate the leaner nineties ahead . Blindsided in a way that resonates even today in the Versailles-Takashi Murakami cupcake; the institution wins, even in the era of Sarkozy, when aesthetics look to Alain Badiou to learn how to substract. The French art scene may continue to romantically perceive itself as a tastemaker and there are worse things to wish for. But twenty-five years after, which curator would readily admit to this? Perhaps those few who readily revere Philippe Sollers’ remarkable volumes of La Guerre du Goût. And what if Paris was currently the city for romance gone wrong?